In reality however these developmental areas are not disconnected and disengaged from each other. In any organism, and in the human being at a much higher level, all of these different developmental areas are highly intertwined and decidedly connected. 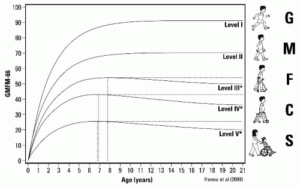 In fact, as our developmental hierarchy graph below attempts to illustrate, the different areas of development are not only interwoven with each other, but the developmental potential of the so called “higher and cognitive levels” is dependant upon what happens at more basic and fundamental levels. One example that illustrates the difficulty in attempting to disconnect the developmental areas from each other can be understood when one observes human speech and communication development. Within the world of the Speech Therapy specialists it is known and widely accepted that a child who cannot adequately swallow and chew will not be able to learn to speak. This shows us how in the human being so called “higher functions” such as speaking are dependent upon at least a minimal level of basic life functions. In effect it is so that if a child cannot chew and cannot swallow, and – in addition – has a sufficient weakness of the respiratory level, then any attempts to “teach” the child to speak with speech intervention methods will be in vain. Sinuses and skull as resonators, etc. The list of the structures that need to be fine tuned and well coordinated for speech function is long and exceedingly complex. Yet a healthy child between the ages of 0- 3 years – through an intense ability to imitate the activities of the people close around him – begins to utilize these structures and to coordinate them in a highly complex fashion in order to be able to use speech as a means of both emotional and later intellectual communication. ABR Program and Method has shown that for children especially, all development is “Global”. One cannot disconnect one area of development from the other – in the human organism development of one “area” is dependant upon the stability of other areas. We cannot dissect the developmental regions and place them on the floor of some workshop as one can do with a car – put the brakes in one corner, the carburettor here, the engine there, the starter motor on another spot! This does not work with the human being. Activities and capabilities rest upon each other – are interdependent and co-exist. The parents and children in the ABR Program have found a fortunate means of global developmental enhancement. ABR is a Program that promotes transformation of all developmental levels respecting the inter-connectivity of processes within the human being. In this way we can see that the soft tissue remodelling achieved through ABR applications work as a foundation for the child’s higher development – whether having to do with basic life functions which are depnedent upon a stable intrinsic strength of connective tissues, – or higher capabilities such as speech and understanding. ABR works as a Global Developmental Enhancement tool, allowing parents and caretakers to dramatically change the life and life quality of mild to severe handicapped and special needs children. How to nurture the development of the proper limb trunk coordination in children and adult individuals with special needs. Human movement is dependant upon precise limb/trunk coordination. Due to the lack of a sufficient intrinsic structural stability of the trunk – most notably in the spine itself – children with special needs lack the spinal strength and mobility necessary for initiating movements from the trunk. The stiff or immobile spine leads to disrupted limb to trunk coordination, which becomes obvious both when the children attempt to move or when movements are initiated with them from without. Typical of this lack of a sufficient trunk limb coordination is also a tendency to carry out “robotic” movements, to use excessive muscular effort and also to require a high level of concentration for carrying out movements. Older and adult individuals on the other hand may have developed some level of gross motor function, but this function can also most frequently be characterized as ”stereotype” or ”robotic” in nature. This robotic function often leads to joint distortions, stiffness, pains and discomforts, etc. The purpose of ABR exercises is to create the environment and the conditions that support the child or adult to develop and to initiate the undulatory motions of the spine rquired for creating the proper trunk limb coordination. ABR applications achieve this at ages and stages where it is normally no longer possible for the person to establish this coordination themselves. In fact the integration of these primary movements and stages of movements connected to the spine, belong to the earliest motor developmental moments of life – which normally are completed between birth and six months of age. If this coordination is not already established by then, the child or adult can no longer initiate and establish these intrinsic movements on his own. ABR Techniques open a new door of opportunity for such individuals. The sequences of activation necessary relate not only to the trunk and the limbs in their related coordination, but also correspond to specific muscle fiber types belonging to the trunk and limbs respectively. The muscle fiber types that react first during normal muscular activation are most highly integrated within the trunk (type one) and those that have a higher reaction threshold (type two) are more highly integrated within the superficial muscle layers of the limbs. Whe persons with Cerebral Palsy, or other illnesses affecting the motor skill function go through training or ordinary rehabilitation and other exercises – this out of necessity will tend to initiate an inverted sequence of reaction within this highly organized muscle reaction sequence. The waking up of and activation of the type one muscle fibers of the trunk belongs intrinsically to ABR work which is designed to install the “baby stages” of deep intrinsic undulatory spine movement in children and adults who have long left the baby age – and also in those children who may be at this young age and are too weak or too stiff to initiate the proper coordination between the deep intrinsic muscles of the trunk and those of the limbs on their own. ABR based active exercises that we call PAVES or “Peri-Articular Visco-Elastic Stimulation”. These exercises work to strengthen the trunk, encourage the development of deep undulatory trunk movement, stabilize the joints, etc. without causing stress to the persons weak structures and without creating a high cost to the individual’s energy household level. These exercises involve the application of specific and well-controlled movements applied : soft gymnastic balls, soft room trampolines and visco elastic pillows and materials. TheraTogs Usage is in itself a great way to promote a healthy coordination of limbs and trunk. The TheraTogs is a specialized garment that helps children with special needs to stabilize their trunk. When trunk stability is present and the child is not so highly dependant upon muscle tension for creating this stability, then the trunk can react in a more appropriate manner and it is possible to establish the proper sequence of activation of the limbs in respect to the trunk. This garment can easily be integrated into daily routines. It will add a significant advantage to all movements performed by the users. It adds tensional uniformity and intrinsic pre-stress to the trunk , which in turn allows for a higher freedom of limb activation. At the same time it encourages physiologically sound tissue remodelling – creating a continuously improved intrinsic foundation for movement development. In children with cerebral palsy and other related disorders, as well as in individuals with reduced muscular skeletal function, one is dealing with widespread degenerative processes that have a spiralling negative effect on all tissue systems. The bone layer, in the sequence of layers from the surface of the body inwards, is the deepest structure. – If we name the main layers of tissues from the surface of the body moving inwards we find: skin, fat, muscles – and then bones. The bones are structures that are also highly dependent upon sufficient mechanical stimulus in order to maintain their structural integrity. When sufficient mechanical loading or mechanical stimulus comes to the bones through the outer layers, then the bones will “model” and “re-model” themselves in respect to the stimulus from the surrounding tissues. In the case of children or adults with a weakened connective tissue system, these very “bone structures” receive much too little mechanical stimulus from the interaction with the physical forces of the environment through the surrounding tissues. In this case, the bones do not grow sufficiently and do not go through the structural transformations necessary to bring the person to the next functional level. Or – even if they more or less keep growing in the length, the bones do not achieve the needed bone density that is necessary to properly bear and carry the weight of the child. Problems such as hip-subluxation, scoliosis, contractions, spontaneous fractures are only the most obvious problems which show up. All of these difficulties have deeper lying origins, which are related to the general weakness of tissue quality and the inability of the surrounding tissues to transfer mechanical stimulation. Of course – at the same time – the entire organism is lacking the physical movement necessary for positive tissue remodelling. When the general respiratory/metabolic level is weak, the individual will exhibit a diminished tissue quality. The skin, the adipose fat, the muscles – all show signs of weakness and depletion – or in fewer cases but also present, the fat layer will be thick and overly dense. Neither the overly dense tissues nor the depleted tissues can provide a proper surrounding and base for sufficient bone stimulation. When the bone – as being the most dense layer of the body – is weak, then this also has a cascade effect outwards towards other tissues. In general the connection between the bones and the surrounding tissues is of poor quality. Improved “enthesis” or attachments between the muscles and the bones. The enthesis is the connective tissue arrangement between the ligament/tendon and the bone. When the tendon to bone attachments are weak, then the muscles do not have the needed stability for the muscle contraction. Then the motor function happens in a disorganised manner. By stimulating the bones in this fashion, we stimulate the entire connective tissue “cake” – meaning all other layers are stimulated with the improved bone stimulation. The vibrational movement of the stick done in an open chain fashion also helps the child or adult to release a great amount of accumulated tension. Wheel chair bound persons collect tensions the entire day, because they cannot perform basic movements, move their arms and legs and do other activities all of which allow for tensional release. The tensional release also translates into improved sleep and relaxation. Many families are reporting an improved sleep of the children when tapping is performed during the day and before bed. Reduction of spasticity in the feet and in the hands is apparent with consistent Osteo-Tapping combined with the power socks or other wrap methods. At the same time this is one of the easiest of all the ABR methods to perform. It can be done at any time of the day with a most minimal set up. Positioning is not difficult! We have been happily observing the positive development effects of the Osteo-Tapping method and encourage our families to use this method on a day-to-day basis. The clearest means of describing the connection between structural deficiencies and functional limitations is through an understanding of the ABR based concept described as: “Wrong place, Wrong movement “ . This concept of “Wrong place, wrong movement” allows us to administer a more exact analysis of functional limitations of movement, than the commonly recognized ideas regarding the range of motion, spasticity, etc. These classic concepts fail to recognize obvious structural links within the musculoskeletal system that directly lead to conditions such as: hypotonic cases, cases of fluctuating tonus or even the more classic cases of spasticity. And because they fail to analyse the deficiencies of the musculoskeletal structure, the classical methods of treatment also target false areas of the body for treatment through stretching, training and even surgery. If we take the example of a classic case of a spastic child with Cerebral Palsy (CP), the most obvious and visible problems would be regarded as limited mobility of the arms and poor alignment – or even deformities – of the shoulder, elbow, wrist and hand. The classic approach of physical therapy in such a case would be to try to force extra mobility, either through stretching or weight bearing – via attempts at crawling, kneeling, etc. However, even when hundreds of hours are invested, such attempts most often fail for the quadriplegic CP child. The concept of the wrong movement – wrong place helps to illustrate why direct forceful measures fail to succeed in improving the mobility of the arms in such a case. The healthy individual serves as a comparison for wrong place/wrong movement whereby the opposite situation is at hand: right place/right movement. Stability of the entire shoulder girdle including the shoulder blade, the clavicle, and the connections between them and other neighboring elements. Mobility at the shoulder joint – which provides the ‘right place’ of movement for the variety of arm performances. In a typical case of quadriplegic CP, one can see that the primary difference between such a child and a healthy person is the excessive instability of the shoulder girdle. In such children it is not uncommon that the shoulder blade can slide as far as onto the posterior neck. At the same time – due to instability of the joints at the sternum – the clavicle typically collapses into the lateral neck. The limited mobility at the shoulder joint, as well as the poor alignment and distortion of the entire arm, is a secondary consequence – although the easiest to notice. This is exactly the situation described by “wrong place/wrong movement”. This also explains why direct attempts to force improved movement of the arm via stretching, in the end results in increasing the instability of the shoulder girdle – in other words the movement in the “wrong place”. What we actually need to achieve is to increase the stability at the level of the shoulder blade – in the ‘right place’ – instead of promoting the mobility at the “wrong place”. ‘Wrong” mobility of the upper arm then causes the ‘wrong’ movements in the elbow, wrist etc. These ‘wrongs’ accumulate and amplify with each level of the body, and as a result, the hand is usually the most visibly affected area. In addition, in severe cases the shoulder girdle could easily become so distorted that the ‘wrongs’ compound upon each other: due to the initial instability it could shift its position so badly as to become immobile as well. These are the situations where ‘fixed’ deformities are visible. Obviously, the same principles are true for the legs as well, where distortions and wrong places of movement at the level of the pelvis, abdomen and lumbar spine cause secondary spasticity and limited movements at the levels of the hip, knee, ankle and foot. This concept of the right movement in the right place gives us a working roadmap for rehabilitation. Right place, right movement could be seen as an obvious neutral point or “zero” level − as the starting point from which a normal or healthy child begins to develop his motor functions. Depending on the extent of distortion of the musculoskeletal structure and the general depletion of the internal structures, a CP child might have reached a negative level being as low as [-5] or [-6] below the zero level. This understanding of the zero level as being equivalent to “right movement – right place” is essential for any rehabilitation strategy. Any attempt to teach the child to have some function within the limits given by a structure composed of negative components, can at best be a gamble at best The outcomes are unpredictable and even the achievements are very short-lived. Any extra motor activity based on the “wrong movement – wrong place” achieves functional gains at the expense of further distortions and aggravations of the structural negatives. The ABR approach is based on a long-term improvement strategy. A child progresses by reducing structural negatives with functional results following spontaneously. Only after arriving at the “zero” level of normalised bodily structure and mobility, can the focus of rehabilitation legitimately shift to true gains in function. First at this level, can a child truly begin to build the strength and coordination necessary for dynamic function. Hence ABR is often described as the process of the reduction of negatives. It is necessary to significantly reduce the negative structural components before the child can obtain the momentum required to begin achieving functional improvement through increasing motor activity. First then can the child’s own motor activities bring extra strength and improvement of structure at the right places via healthy movements. Parents have asked me to comment upon the relationship between ABR and other Bodywork or Manual Therapies. The last 30 years has witnessed an sudden increase in the development of manual and body work therapies. Whereas the chiropractic and osteopathic methods have long been established in the Western world, today’s body workers offer therapies that range from Rolfing, Feldenkrais, Myo-fascial release, Stecco Method, Cranial-Sacral Treatment, Bowen Method,. – and the list goes on and on. Although each of these methods can have positive effects on pains and other ailments, not one was developed with the specific needs of individuals with special needs or specifically cerebral palsy in mind. ABR was developed exclusively with and for special needs individuals and their parents and caretakers. More recently however, all of the various manual therapy methods have become united under the umbrella of the “fascia based research” that supports the clinical results that therapists have been experiencing under their own hands for years. At the same time this research reveals the magnitude of potential that can be tapped into when one to takes seriously the properties for renewal that each and every person has within his own connective tissue or fascia system. In tempo with the scientific research being performed with the connective tissues, ABR is developing its own techniques and rehabilitative reach. This is something unique to the ABR method. ABR is in a continuous state of transformation – creating new techniques that integrate the findings brought through the fascia research. The human bodies own system of connective tissues is a system with characteristics and properties that are entirely different to those of more highly developed structures – for example the muscles or the nerves. Below is a list of a few of the traits that are unique to the connective tissue system of the body. Following each quality I have given an example of how ABR has integrated these scientific understandings into the development of the ABR method. – A Basic System – The connective tissues build the foundation for more complex and more highly differentiated systems. ABR knows and shows that by building the foundation of the body as seen in the connective tissue system, one can achieve improvements at most of the higher levels. – Transanatomical – meaning that connective tissue structures are not limited to one anatomical structure but interpenetrate and cross unlimited anatomical boarders. ABR confirms the transanatomical quality of the connective tissues which allows one to work in one area of the body and achieve global effects. The collected knowledge of the transanatomical fascia based connections are actively integrated into ABR strategy. – Energy neutral and Energy thrifty – meaning that working with these structures is an energy thrifty choice and not energy expensive for the organism. Other structures such as muscles and nerves consume massive amounts of the bodies energy supply. The connective tissues do not consume much. They are self sustaining and energy efficient. This knowledge and understanding forms a basis for the entire ABR Strategy that incorporates the idea that anything we do with or for the child either presents a Gain or a Drain. The E-ABR concept allows a comprehensive assessment of the child’s daily environment. Together with the families we can assess and lay a plan for an energy usage reduction for the child that will then in turn allow the child to make the necessary improvements and reconstructions at the level of growth and tissue differentiation, that in turn lead to improvements in both structure and function. – Bio-tensegral construction. The ABR techniques are bio-tensegral in nature. They work actively by applying stress within a bio-tensegral range and are able to achieve a magnification effect through respecting the bio-tensegral qualities of the tissues. At the same time the bio-tensegral concept of connective tissue construct allowed for ABR to discover techniques that administer effective reconstruction to all layers of the body – from the visceral (inner organs) to the muscular or even the skeletal levels. – Embryological Based – The origin of the connective tissues is the embryological mesenchyme. This name points to the fact that the connective tissues maintain embryological characteristics throughout the entire life of an individual. ABR actively integrates knowledge attained from the study and understanding of embryology into the development of its techniques and strategies for application. The body of a child or individual with cerebral palsy has “fallen several levels” as it were. The tissues of the child have returned to earlier less differentiated stages. An understanding of how the tissues can progress and metamorphose from the less differentiated to the more differentiated state builds one of ABR’s basis of reasoning and works into the strategical development. The thorough endeavor to understand and meet the needs of the mild to severely affected individuals, has led ABR to the development of a distinctive comprehension of connective tissue degeneration. This elaborate clinical diagnostic tool would take several hundred pages to describe. Having mastered the ABR Assessment however allows the Assessors to determine and prioritize which ABR applications will bring the fastest and most effective improvements and act as developmentary drivers. This clinical diagnostic tool, that was developed side by side with the ABR techniques, is unique to the ABR Method. It could then, in turn lead to the development of the varied and exclusive ABR Techniques that differ both in the scope and applicative format to all of the other existing manual therapies. The ABR Techniques themselves – when compared to other manual techniques that can take anywhere from six years to a series of many weekends to learn – are so devised as to be teachable to parents and caretakers. One can become proficient enough to apply the techniques with great success to the children and adults in the program in an initial teaching session of about eight hours duration. The ABR techniques can then be applied on a daily basis – this in itself differs from most of the other manual techniques that are devised to be applied on – at most – a weekly and even then – only on a limited basis of up to 10 sessions. Neither is the effectiveness of ABR Techniques comparable to other manual techniques. Parents and caretakers alike can achieve heretofore unheard of reversal of severe structural deformities and even life function weaknesses through their own work in their own homes. The inserted graphs show how ABR has achieved a radical shift in focus in respect to rehabilitation and why this shift in focus is so successful. In the human being higher function is generally dependant upon more fundamental functions. The diagram illustrates the fact that – if the strength of the connective tissues is weak, then there is no firm foundation within the body for the life processes. The respiration will be weak – the metabolic processes are constrained. The life processes rest upon a firm connective tissue base. In the case of CP as well as a wide variety of genetic and chronic illnesses, the child is challenged at this level. Challenges at this level, can make it almost impossible for him or her to develop the next level seen in the diagram. There will inadequate weight bearing; the compressional strength of the body is impaired. Proprioception as well as internal “interoception” is indistinctly defined for the individual. When deficiencies such as these are present, the primary movements that are normally developed within the first six months of life do not unfold. The child does not learn to move the spine in the undulatory fashion. He cannot “worm” himself around on his back, cannot rotate the spine or flex it to the side in a snake like fashion. This huge variety of spine movement is dependant upon the ability of each single vertebra to move in respect to each other. The single vertebras of a child in this condition do not reveal much movement in respect to each other. The primary dynamic repertoire belonging to the first six months to one year of life does not unfold. This will result in the child being locked in respect to his own development. Gross and fine motor function in this condition will definitely be impaired. The primary dynamic repertoire belonging to the first months of life cannot be “taught” and “learned”. Imagine yourself trying to improve the movements between the sixth and seventh spinal vertebrae or between the fifth vertebrae and the sixth rib! This is fully impossible. If the child has not learnt it in the first six months, he can no longer learn to do it alone. He needs the help that ABR brings to “learn” to develop and to utilize the spine movements. This does not mean that a child cannot “jump over” the purple and the blue levels shown on the diagram. He can jump over and develop communication skills, make cognitive advances, etc. But what can never happen is that the higher levels of development can bring up lower levels. No matter how clever a child becomes, weaknesses at the lower levels will not be alleviated. One needs the improvements of the lower levels for true developmental flourishing. Therefore ABR work means going down deep and restoring the foundation of the internal stability and tensional connectivity of the body. When these levels are improved and restored, then development appears in a blossoming and in a “sprouting” like manner. The child begins to flourish at the higher levels without extra work – attaining the ability to focus, be attentive, communicate – even speech and thought process are possible in severe children. For children and adults with cerebral palsy and a wide variety of disorders, ABR restores the base, the fundament, the foundation allowing for higher functional development in mild and severely impaired individuals. One father of a very severe child with a rare genetic disorder recently told us at an ABR Assessment: “This child does not come with a “User Manual”. This is something we hear from many parents and many families. Even though countless “healthy” children today also come with their own special difficulties and challenges, the challenges that the parents of special needs children meet with every day and night are enormous. How could any parent expect to be able to meet with these challenges in the most optimal way? At the same time these children take ones entire strength – often day and night. We see parents who come to courses – where the father simply falls asleep exhausted whilst the mother learns ABR Techniques and Methods! We have mothers who fall asleep during the ABR Assessments. How could any parent be expected to be able to do all the extra research and achieve the high level of understanding needed for gaining the optimal outcomes for these children, if they do not even have the strength to stay awake due to long nights of troubles and anxieties? How can they be expected to learn more about their children and their children’s needs if the child has multiple seizures each and every day, digestion troubles, respiratory difficulties, emotional issues and so on? This is where ABR can offer something that no other training method can offer. We at ABR know your troubles from the inside out. All ABR centers are directed and also partially staffed by the parents of Special Needs Individuals. These are all people with the life experience on top of the professional experience to be able to assist parents with choosing the best priorities for boosting the child’s development. We know that a family cannot thrive if the child does not sleep at night. We know that a child who throws up 20 times a day and more cannot thrive, until this issue is cleared up. Reflux, constipation, respiration difficulties, sleep – these need to be prioritized initially above motor skill development! Then further ABR has shown conclusively, that if one concentrates on the basic life functions, the motor skill development will start to come on its own. The child will have more resources, the family will have more to give and more strength for maintaining the family coherence! A special needs child does not live in a vacuum. It is even more dependent upon the strength of the family than any other child! Do not underestimate what working from the bottom-up by following the ABR protocols can bring – what each of these small life change gains can bring to the family, and then, by way of the strengthened and empowered parents – to the children and special needs individuals: boosting their lives, day by day – bringing improvements, little by little!